It has been a little more than a month since my last tour of the vegetable garden. I just went back to the tour that I posted on February 25 to compare and can see that there has been a lot of growth. 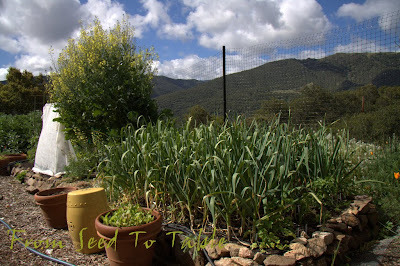 The garlic has shot up higher and the Portuguese Dairyman's Kale is in full bloom. 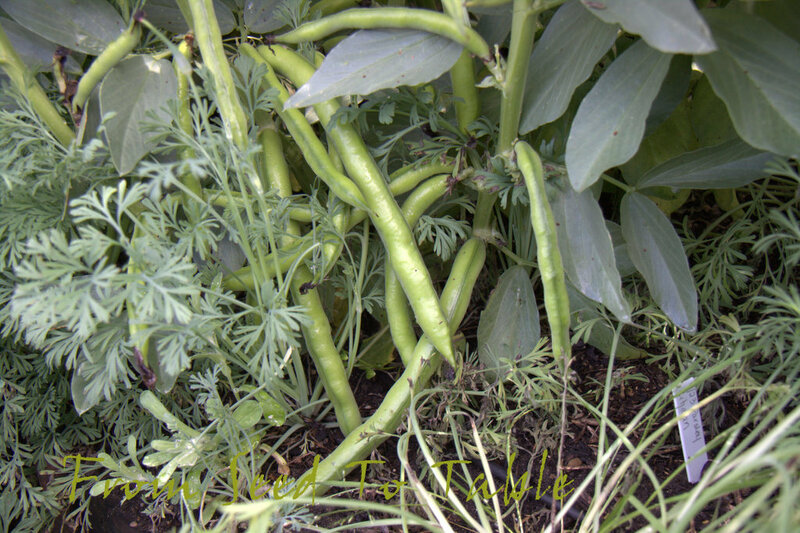 The Sugar Magnolia Purple Snap Peas have come out from under their protective cover and grown a foot. Seedlings of Yellow Giant and Green Beauty snow peas have replaced the Kefe Beinwil snow peas and are under protective cover most of the time. 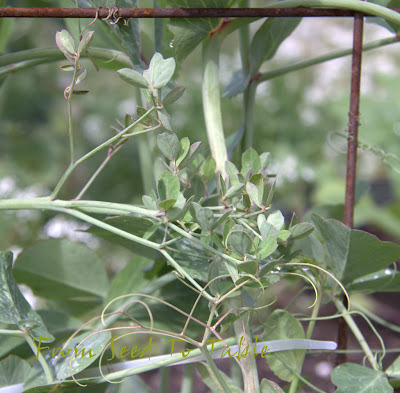 Some of the Purple snap peas have tendrils that end in leaves. 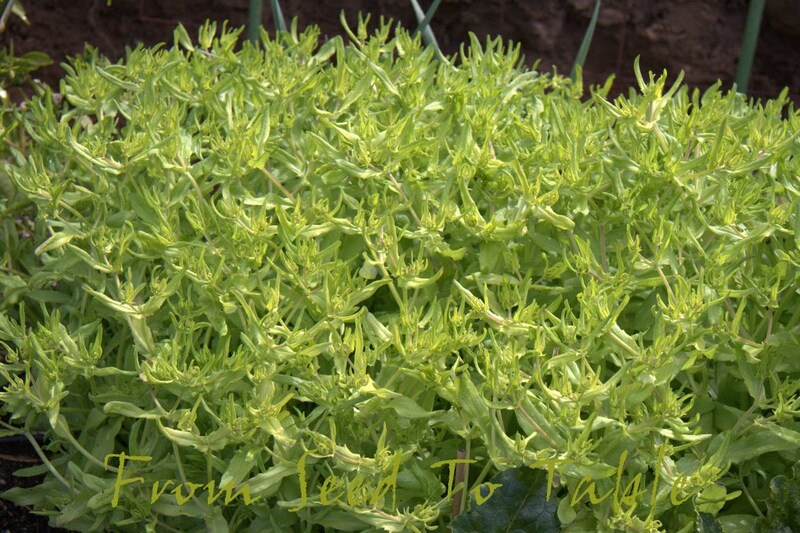 This variety has these leafy tendrils, regular tendrils and hyper-tendrils. On the other side of the peas are a couple of smooth leaf kale plants that have started to bolt. I snapped off the flower tops and have been cutting the leaves for the chickens. 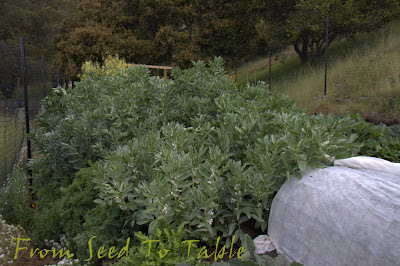 The low growing plants in the center are Purple Flowering Choy Sum. And there's one small Romanesco Broccoli in the front from last fall that hasn't produced a head . . . yet. In the next bed the favas are growing like crazy. There's some black aphids on a few of the plants but they haven't gotten out of control, a lot of the aphids have been parasitized by beneficial insects. It's time to start harvesting fava beans! These are the Early Violet variety. These are Azur Star kohlrabi which were not yet planted out at the time of the last tour. They are already forming small bulbs. The Green butterhead lettuce is sizing up rapidly. I almost lost some of these to a gopher, the gap on the right is where one of the set of seedlings got attacked. Two little plants survived and I replanted them, that's the two small plants in the back. 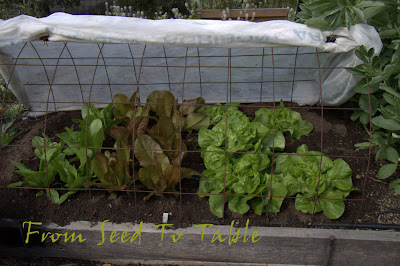 To the left are seedlings of Cimarron and Noga baby romaine plants. I've kept the remay over the lettuce plants to protect them from the sun, we had a few days of unusually warm weather not long ago. On the other side of the main path the Monticello Poppies are starting to send up flower stalks. It will be interesting to see how much seed this patch produces. 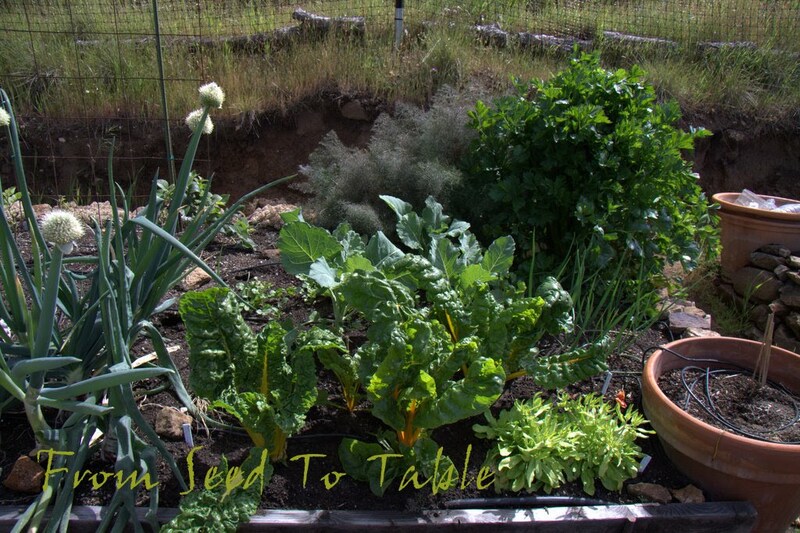 To the left of the poppies are beets and golden corn salad. 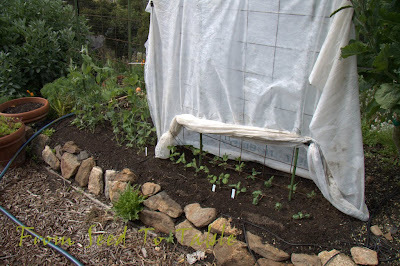 The empty spot in front of the poppies is where I pulled out the Olive Leaf Rapini. Can you see the beet root peeking out under all the foliage? Finally, a Burpee's Golden beet nearly ready to harvest! I've been trying for a year to get them to grow. The Golden Corn Salad is about to burst into bloom. I love that color, it looked beautiful with some burgundy beet foliage that was there until not long ago. Over here is the crowded planting of Even' Star American Rapa (on the right), Pancalieri a Costa Bianca Frisee, Mizuna, and some radishes that are supposed to be grown for their tasty leaves (can't remember the name). 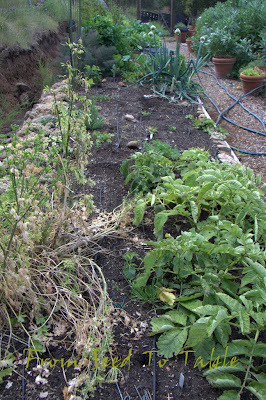 In the back on the right are the scraggly but still alive and trying to grow Padron peppers from last year. 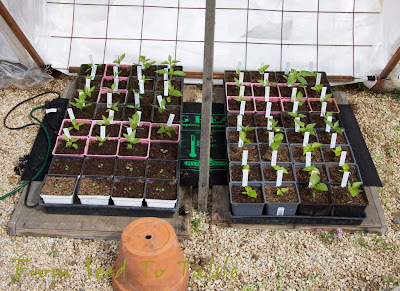 And in the rear on the left are the young Piracicaba and Romanesco Natalino broccolis that have outgrown their water bottle cloches. From front to back: Mammoth Red Rock Cabbage, Romanesco Natalino, and Piracicaba broccoli. 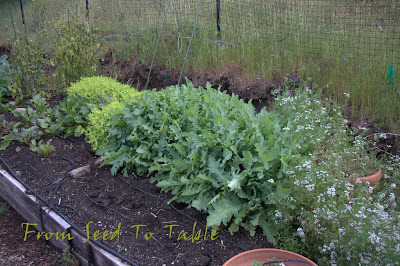 One more view of the brassica bed. The next bed over is where the Golden Chard is happily growing. Behind the chard are a few small Gigante kohlrabi, and behind that are the Red Florence Fennel and the bolting Hollow Pipe of Malines cutting celery. Some small scallions can be found on the right and some humongo overgrown scallions are taking up space on the left. The potatoes seem to have shrunk from the last tour. Is it time to harvest or have the sow bugs just been munching excessively? Don't know. The parsley on the left is ready to be cleaned out. The whole bed has to be cleaned out soon, this bed is the future home of my tomatoes and a lot of peppers. That's it for the vegetable garden. 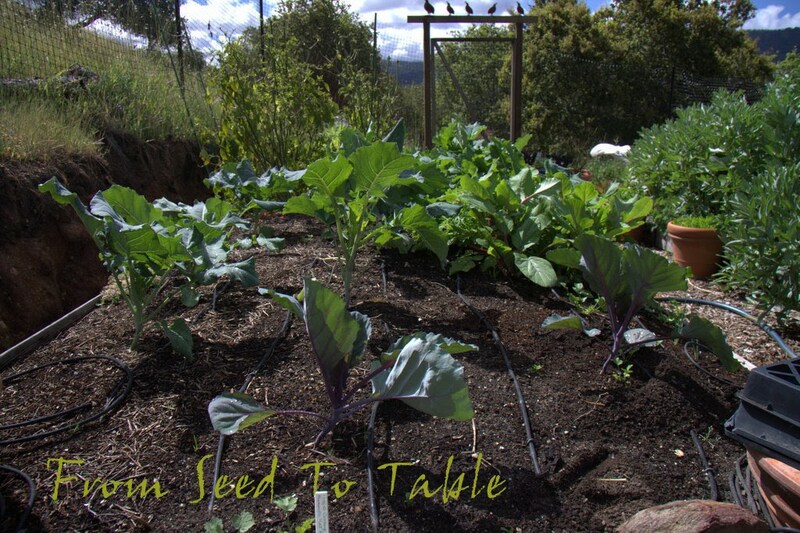 Next up will be some highlights of edibles growing elsewhere around the garden. Here's the newest addition to the harvests this year, Green Butterhead lettuce and young Mizuna. I made a simple salad with these that I dressed with my husband's favorite dressing of lemon juice, dijon mustard, honey, olive oil, salt and pepper (and a touch of truffle oil). I included some roasted beets on the side, dressed with the same dressing, and sprinkled some toasted sliced almonds over all. It was a busy week with house guests from Wednesday through Sunday so I didn't get around to harvesting anything else. I did get a few nice shots from our drive down the Big Sur coast so perhaps I'll post of few of those later. Butterhead lettuce - 5 oz. Noga Romaine lettuce - 1.25 oz. Cimarron Romain lettuce - .5 oz. Total for the week - 8.25 oz. 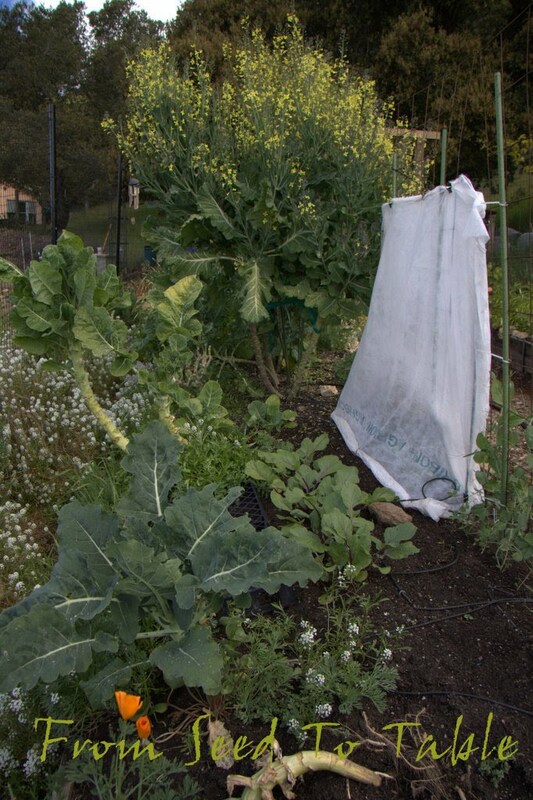 Spring has sprung in a big way in the vegetable garden. We've had wonderful warm and sunny days the in the past week and the vegetables seem to be growing by leaps and bounds. 3490RO Even’Star American Rapa OG (27 days for mesclun, 40 days to full leaf) Brassica oleracea “A real trooper,” according to breeder Brett Grohsgal, for its speed of growth and sweetness of leaf. 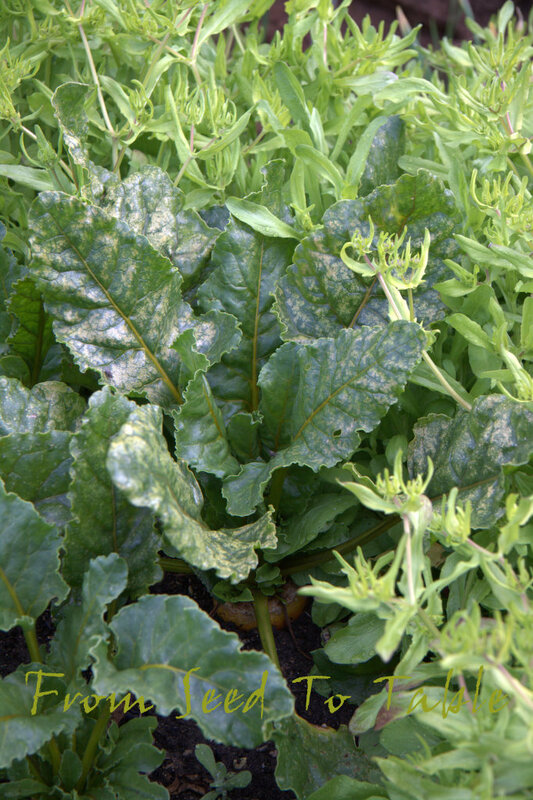 A vigorous mild-flavored relative of the more well-known kales and collards without the hairy leaves and bitter or pungent taste of most European rapas. This strain, developed in southern Maryland, was selected for strong autumn growth, winter survival, spring re-growth and tolerance to BL and PM. Smooth slightly lobed leaves best when harvested at 9", though younger smaller leaves may be snipped for mesclun. 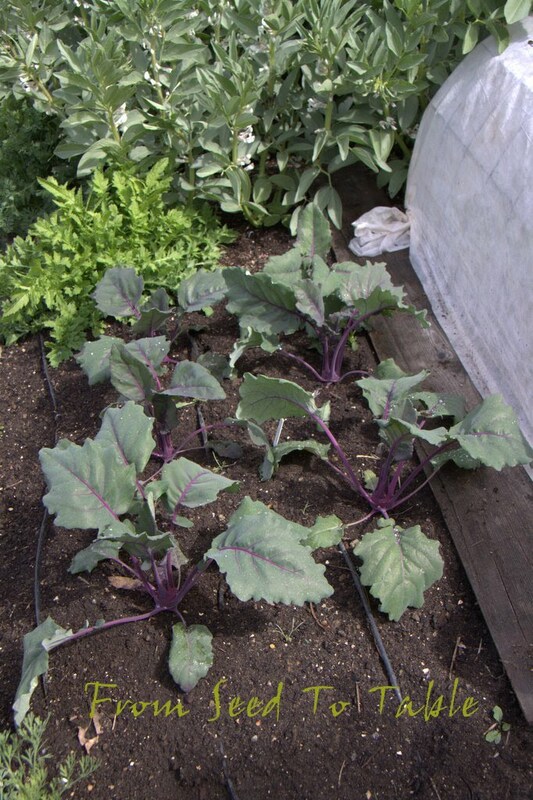 Plants hug the ground much better than collards, helping account for its cold tolerance. Sweeter than most kales or collards, with a more delicate flavor. Though it doesn’t tipburn in heat, it is adapted for cool season rather than summer plantings. MD-certified. It's interesting that the description compares them mostly to kales and collards, I've found them to be more like rapini in flavor and tenderness. I would recommend them to anyone who wants to try a less bitter rapini type of green rather than as a kale or collard substitute. These plants were started in paper pots on January 18, indoors, than moved out to the garden under a remay covered tunnel. The protection was more to keep the critters from munching than for the cold. 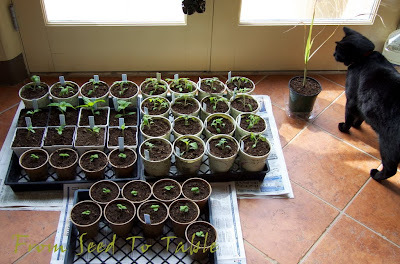 I sowed 4 seeds per paper pot, most of which germinated and thinned to 3 plants per pot. I didn't thin again until last week. 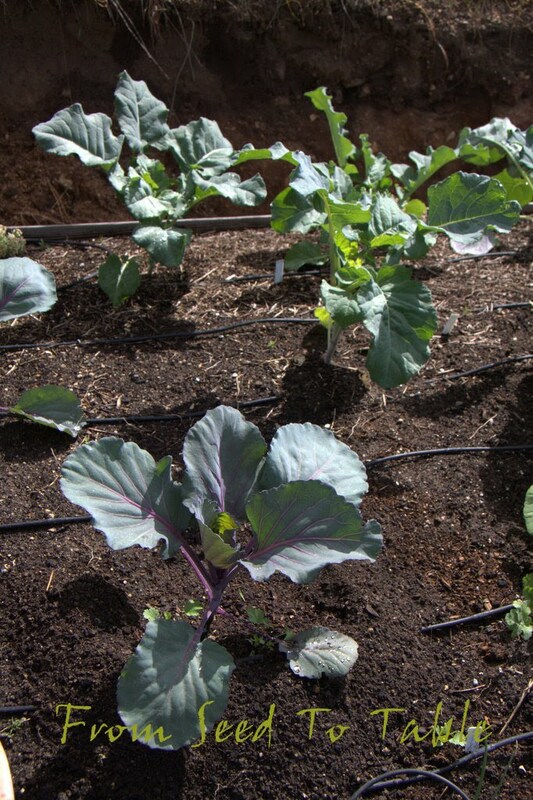 The plants seem to do fine with some initial crowding, then I start cutting plants at the soil line when they are fairly large. 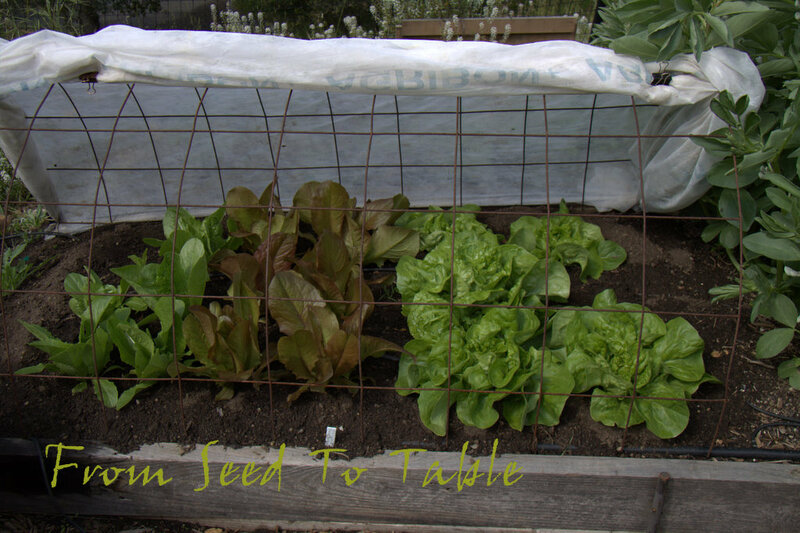 Once I'm down to a single plant in each space then I will harvest just the leaves until the plants start bolting, then the whole plant is harvested. Forty days to full leaf harvest seems to be an accurate timing if you start picking as recommended when they get to 9 inches. I've found that the larger leaves are fine to my taste, so I let them grow longer before harvesting. 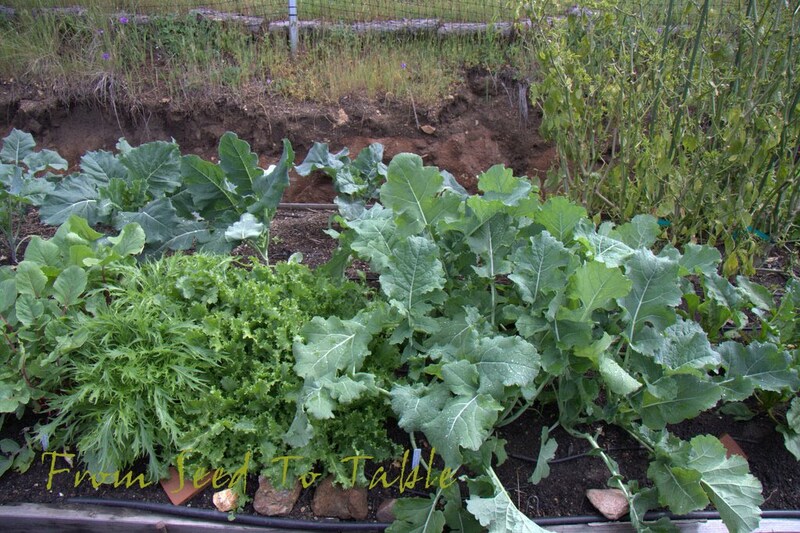 Now that I'm harvesting these plants I need to start some more, this time it's back to the Olive Leaf Rapini. The basket also contains tender young fava leaves and some beet thinnings. I blanched the rapa and then sauteed it with the fava leaves and the greens from a large beet that I harvested that day. Another harvest of rapa yesterday was sauteed with Golden Chard along with some pine nuts and currants. Chioggia Beets - 14 oz. Beet Thinnings - 1.75 oz. 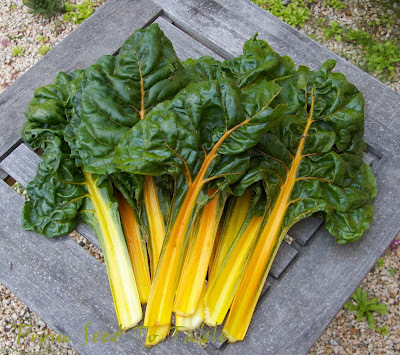 Golden Chard - 16 oz. Fava Leaves - 3 oz. Green Garlic - 3 oz. Even' Star American Rapa - 24.75 oz. Red Florence Fennel - 5.25 oz. Total for the week - 67.75 oz. or 4 lb., 3.75 oz. Total for the year - 38 lb., 4 oz. 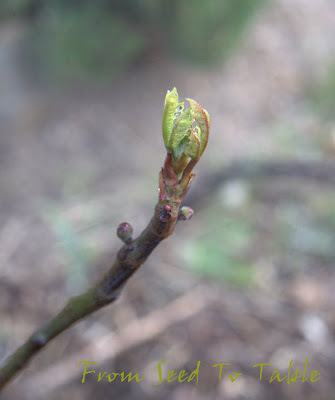 There's leaves popping out on 3 of the four new fruit trees that I planted on February 3. 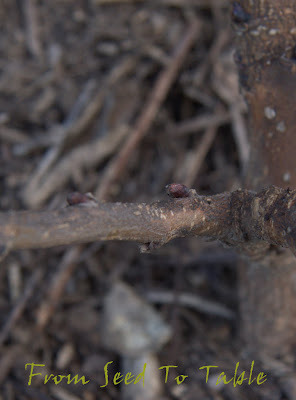 The little tiny stick of a fig tree, Violette de Bordeaux, has a little tuft of leaves at the tip of the "trunk" and is even sporting a few baby figs. The Panache fig is putting out leaves along the top of the trunk. I really need to cut this tree down to about 18 inches since I want to train it into more of a bush than a tree, but it's just so hard for me to lop it off. But, now that I know that it's going to take off I need to get it done before it gets out of hand. 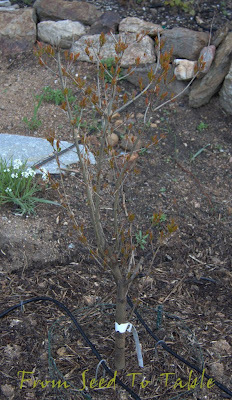 The Sweet pomegranate was the first tree to leaf out and seems to be really happy. I'm going to pull some of those upright branches down into a more horizontal position to give it a better form. They seem to be a bit too tiny to hang rocks off of, so I plan on using some green plastic ties tied to the branches and staked into the ground. 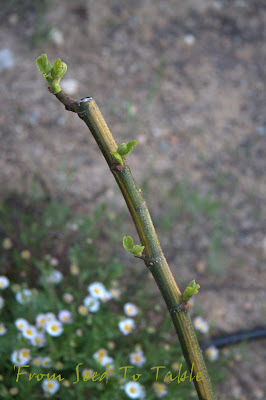 And finally, I hope that I see a bit of swelling in the buds on the mulberry. It's not looking as good as I would like, but at least the branches aren't dry and brittle. If I remember correctly, the mulberry tree in my last garden was always one of the last trees to leaf out. Well, I'm kinda cheating for this Harvest Monday, those lemons are not from my garden, but I did get to harvest them myself, well, my husband and a couple of friends helped also. We were allowed to harvest as much as we liked from a private citrus grove just down the valley. Not all the trees had labels left on them, but we were able to identify some trees as Eureka and some as Lisbon, the rest were most likely Eureka and Lisbon as well, those are the most commonly grown *real* lemons around here. 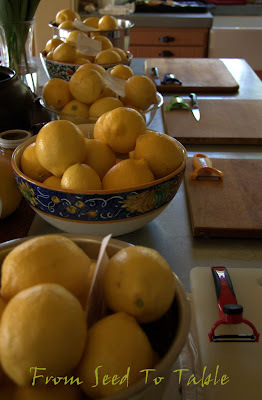 We all passed on the Meyer lemons since we have more than enough of our own. So, just what were we doing with all those lemons? Notice the peelers? What's missing in the photo are the 4 or 5 liter mason jars and the bottles of 100 proof vodka. Still haven't figured it out? We had an impromptu Limoncello making party! Or rather, more of a Limocello making competition, there is a just a wee bit of competitiveness in this group. So the clear winner of the *handiest with the peeler* award had an unfair advantage, he's the only professional chef in the group. We should have handicapped him with a dull peeler, but, he did get us a good deal on the vodka... Anyway, the real competition will be 80 days or so from now when we do a blind tasting of the final products. Cutting Celery - 10 oz. Fava leaves - 3.75 oz. Red "Scallions" (overgrown) - 1 lb., 5.75 oz. Green Garlic - 5 oz. Red Florence Fennel - 6.75 oz. Total last week - 47.25 oz. or 3 lb. 15.25 oz. Total this year - 34 lb. 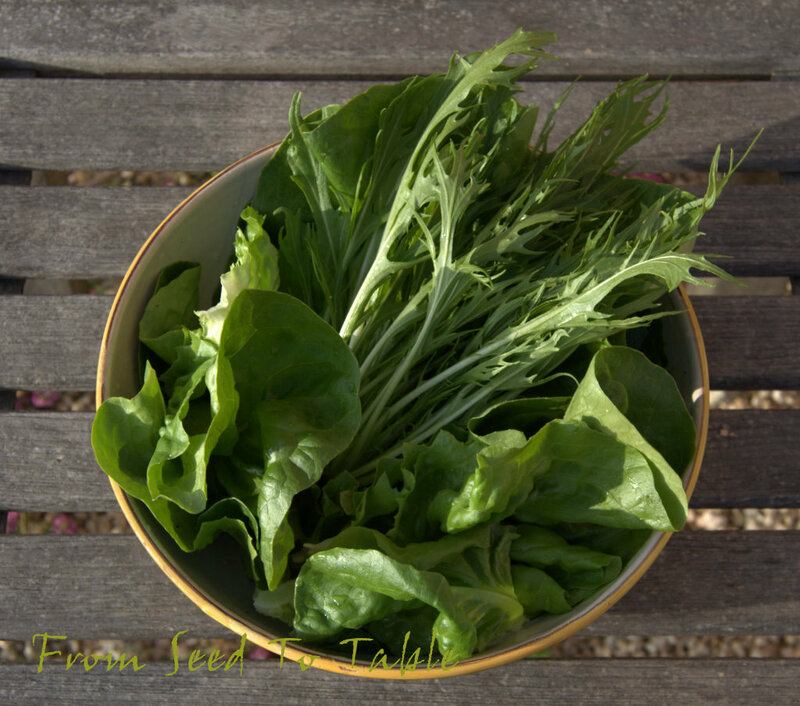 Daphne is hosting Harvest Monday on her blog Daphne's Dandelions, head on over there if you would like to be inspired by other garden bloggers' harvests. The Golden Chard is growing by leaps and bounds lately. I harvested that nice bunch on Sunday. The leafy parts were sauteed in olive oil with green garlic and currants and then topped with toasted sliced almonds and a splash of sherry vinegar. I saved the stems and tonight I'm going to make a gratin with them. Green Garlic - 2.25 oz. Olive Leaf Rapini - 12.75 oz. Frisee thinnings - 7.25 oz. Butterhead Lettuce thinnings - .5 oz. Piracicaba broccoli - 3.25 oz. Golden Chard - 1 lb., 3.5 oz. Total for the week - 2 lb., 13.5 oz. Total for the year - 31 lb., 1 oz. And there were a few beets that I picked and neglected to weigh, oh well! 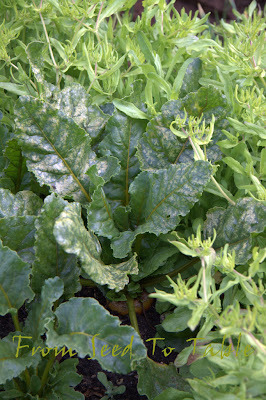 Harvest Mondays are hosted by Daphne on her blog Daphne's Dandelions. Why don't you head on over there and show us what you've been harvesting lately! It seems like it was just a couple of weeks ago that I seeded my paper pots with chile pepper seeds, but it's actually been just over 1 month. Here they are, cozy in the little mini greenhouse that I've rigged up. I put this together with a 6-foot length of concrete reinforcing mesh, a few wooden garden stakes, a few cable ties, some plastic sheeting that the painters left behind, and a bunch of binder clips. It's going to be really easy to disassemble when I don't need it anymore this season. Inside I put a couple of boards on the ground and a waterproof seedling heat mat on top of that. On sunny days I prop one side of the structure up on the flower pot so that it doesn't get too hot. Today I propped it wide open so that the seedlings could get direct sun (what there was of it) a feel the breeze to help make sturdy stems. The tiny seedlings are Yellow Wonder strawberries. At night I turn the heat mat on and close down the greenhouse with a couple of big rocks on top of the protruding garden stakes at the corners. 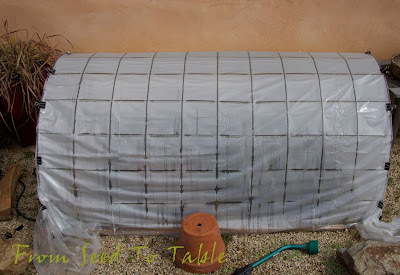 I've also got two layers of frost cloth to clip onto the whole thing for either very cold nights (it's been down in the 40F's lately) or when I transition new seedlings into the green house to provide some protection from the sun until the babies become accustomed full strength sunlight. I just potted up my tomato seedlings, a few slow peppers, and basil yesterday and they are getting their first experience of real sunlight through the living room window. Hank is inspecting the newly planted lemongrass. These will transition out to the mini greenhouse in a few days. There's one more tray of seeds sown in paper pots under the lights on the heat mats indoors. That tray has eggplant and some more tomatoes and peppers that didn't germinate well the first time around. I hope that by the time the last tray of seedlings is ready to go out that I will be able to put some of the first peppers into the garden since the greenhouse is large enough to hold only 6 flats of pots. One of the lemongrass stalks that I rooted in a jar of water on the ledge of my kitchen window is ready to be potted up. These stalks came from a plant that is growing in a large glazed pot out in front of the house. The pot is in a fairly well protected spot and I never brought it inside or even bothered to cover it this winter. The top growth of the plant is brown but the base of the plant is still ok. That plant was started in the same way from a stalk that I bought at the grocery store. 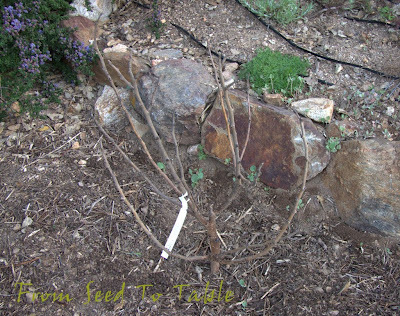 I'm going to try transplanting the original plant into the new garden area outside the vegetable garden. I'm pretty sure the deer won't eat it, I'm not so sure about the gophers, so I wanted to start some new plants. If you want to grow lemongrass that is of good culinary value you have to start it vegetatively, i.e., start from a cutting. If you buy lemongrass seeds they are actually citronelle, a related plant that has a similar aroma but is not very tasty. That's what is used in citronella candles. True lemongrass doesn't bloom and set seeds. Look for lemongrass stalks at the market that are not too dried out. 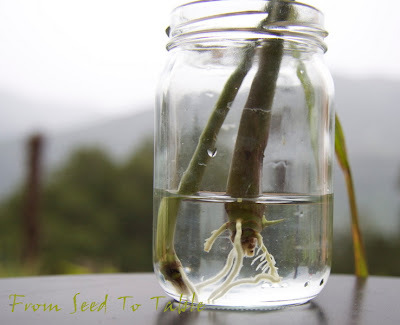 Place them in a jar of water to cover their bases and wait and see if they root. Then pot up the rooted stalks and grow the plants in a warm, sunny location. 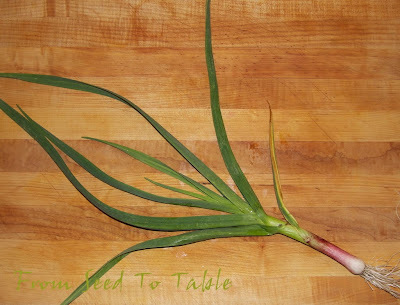 For information about how to grow lemongrass see my latest post about growing lemongrass here. I've got a small sorrel plant in a pot in the garden that is putting out some nice tender new leaves. It's the first time that it's grown large enough that I can harvest some leaves without seeming to cut back half the plant. The sorrel and a couple young fennel fronds, along with some parsley and celery leaves, were chopped and incorporated into a skillet souffle. 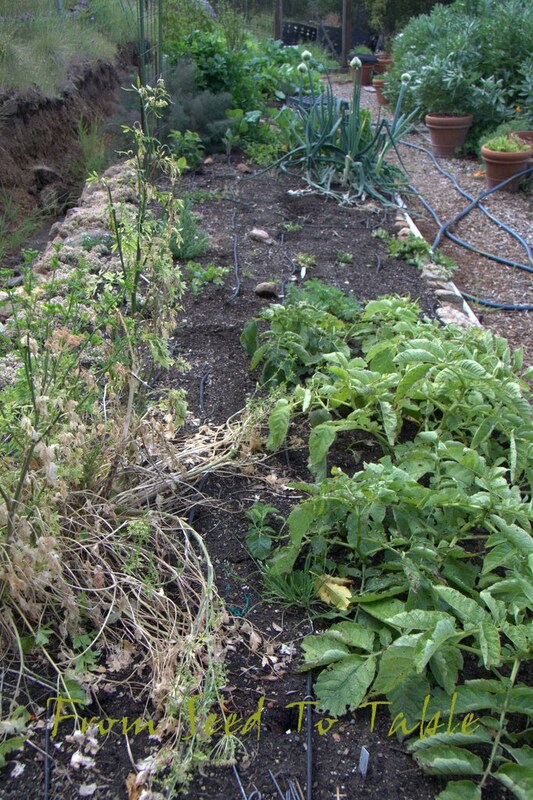 The sorrel leaves are shown above on the right, and going counter-clockwise are the celery leaves, fennel fronds, parsley, plus some flowering shoots from the Lacinato Kale. The souffle recipe is from Jerry Traunfeld's book The Herbal Kitchen: Cooking With Fragrance and Flavor. The souffle is sort of a cross between a traditional souffle and a fritata, with a base of bread crumbs, milk, egg yolks, herbs, and cheese all folded into the beaten egg whites and baked in a hot skillet. 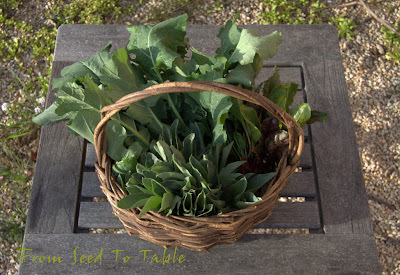 The Lacinato kale started to bolt a couple of weeks ago and I finally remembered this week that the leafy flowering shoots are quite delicious if you pick them when the flower buds are still small, like sprouting broccoli. This is a young Early Portuguese garlic plant. At this size all you can use almost the entire plant like a scallion. It's very mild and tender. I used this young garlic to season some fresh artichoke hearts that I bought from a local grower. Piracicaba broccoli - 5 oz. Cutting Celery - 1.75 oz. Golden Chard - 1 lb., 5 oz. Green Garlic (Red Janice, Early Portuguese, Madrid) - 4.5 oz. Kale Shoots - 2 oz. Romanesco Broccoli - 3 oz. Total for the week: 3 lb., 11.25 oz. Total for the year: 28 lb., 3.5 oz. 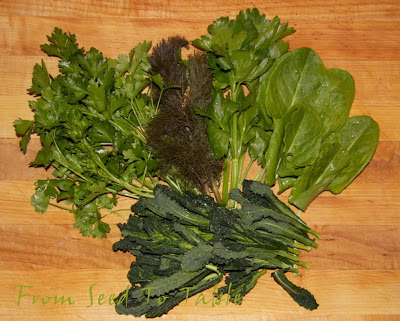 Harvest Monday is hosted by Daphne on her blog Daphne's Dandelions, so head on over there to check out what other garden bloggers have been harvesting lately.